About "NIV God's Word to Go Compact Burgundy Hardcover"
Make God's Word your everyday travelling companion! 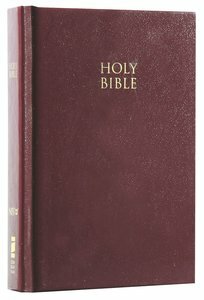 Small and lightweight in your choice of hardcover, softcover, or leathersoft binding, the NIV Compact text Bible contains the complete Scriptures and is small enough to tuck into your purse, briefcase, backpack, or glove compartment. This Bible is an ideal companion for today's Christian on the move.